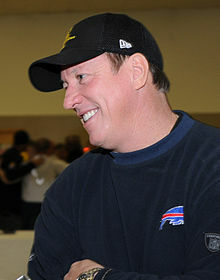 For other people named Jim Kelly, see Jim Kelly (disambiguation). James Edward Kelly (born February 14, 1960) is a former American football quarterback who played in the National Football League (NFL) for eleven seasons and spent the entirety of his NFL career with the Buffalo Bills. He also played two seasons with the Houston Gamblers in the United States Football League (USFL). In 2002, Kelly was inducted into the Pro Football Hall of Fame, his first year of eligibility. His jersey number 12 is one of only three numbers retired by the Buffalo Bills as of 2018. Kelly was born in Pittsburgh, Pennsylvania, and grew up about 60 miles to the northeast, in East Brady. He was a standout at East Brady High School and won all-state honors after passing for 3,915 yards and 44 touchdowns and 1 interception. After his senior year, Kelly played in the Big 33 Football Classic. Kelly was offered a linebacker scholarship instead of quarterback to play college football at Penn State University under coach Joe Paterno. He went on to play for the University of Miami, where he played an important role in helping build the program into one of the nation's best. Kelly finished his career at Miami with 406 completions in 646 attempts for 5,233 yards and 32 touchdowns; he was inducted into the university's hall of fame in 1992..
Because of fellow quarterback John Elway's well-publicized reluctance to play for the Baltimore Colts, which chose him in the 1983 NFL Draft, Kelly's agent asked whether there were any teams he would not play for. Kelly, who disliked cold weather, listed the Minnesota Vikings, Green Bay Packers, and Buffalo Bills. He was pleased to see while watching the 1983 draft on television that the Bills did not select him as the 12th pick in the first round, but learned from his agent that the team had another first-round pick; the Bills chose Kelly as the 14th pick. Although Kelly at the time stated that he had expected the Bills to choose him, he later said, "You have to say those things ... I cried. (Laughs) I didn't really literally cry. I just had tears. I'm like, 'You got to be kidding me.'" Although he believed that team owner Ralph Wilson would not bring in the right players to build a championship team, Kelly was resigned to playing for the Bills. While meeting with the team to negotiate his contract, however, a Bills secretary mistakenly let Bruce Allen, general manager of the rival United States Football League's Chicago Blitz, reach Kelly on the telephone; Allen persuaded Kelly to leave the meeting. Kelly later claimed that the USFL offered him his choice of teams because of the league's interest in signing quarterbacks. He signed with the Houston Gamblers, who played in the climate-controlled Houston Astrodome, and said, "Would you rather be in Houston or Buffalo?" In two seasons in Houston leading offensive coach Mouse Davis's run-and-shoot offense, Kelly threw for 9,842 yards and 83 touchdowns, completing 63% with an average of 8.53 yards per attempt with 45 interceptions. He was the USFL MVP in 1984, when he set a league record with 5,219 yards passing and 44 touchdown passes. Kelly's USFL records eclipsed those of fellow league quarterbacks Doug Williams and Steve Young. When the Houston Gamblers folded, Kelly went to the New Jersey Generals and was slated as their starting quarterback. Kelly appeared on a cover of Sports Illustrated while holding a Generals' helmet, but the league collapsed before he ever fielded a snap with the Generals. Kelly remained on good terms with Generals owner Donald Trump, who provided his family with lodging during Kelly's later health issues. Kelly finally joined the Bills (who had retained his NFL rights) in 1986 after the USFL folded. He helped lead the Bills to four consecutive Super Bowl appearances (Super Bowl XXV–Super Bowl XXVIII) and six divisional championships from 1988 to 1995. Buffalo made the playoffs in eight of Kelly's 11 seasons as their starting quarterback. Kelly's primary 'go-to' wide receiver with the Bills, Andre Reed, ranks among the NFL's all-time leaders in several receiving categories. Kelly and Reed connected for 65 touchdowns during their career together trailing only the tandems of Peyton Manning and Marvin Harrison (112), Philip Rivers and Antonio Gates, (87), Steve Young and Jerry Rice (85), Dan Marino and Mark Clayton (79), Peyton Manning and Reggie Wayne (69), and Drew Brees and Marques Colston (68) for touchdowns by an NFL quarterback and receiver tandem. Kelly, along with Andre Reed, Bruce Smith, Thurman Thomas, and Scott Norwood, was the subject of the 30 for 30 film—Four Falls of Buffalo. Kelly ran the Bills' "K-Gun" no-huddle offense, which was a fast-paced offense named after tight end Keith McKeller, that denied opposing defenses the opportunity to make timely substitutions (the NFL later changed the rules in response to this to allow opposing defenses time to change formations under no-huddle situations, but this applied only if the offense made personnel substitutions). This offensive scheme called for multiple formation calls in a huddle, so that after each play was completed, the Bills would eschew a following huddle, instead lining up for the next play where Kelly would read the defense and audible the play. This led to mismatches and defensive communication breakdowns and, in the 1990s, established the Bills as one of the NFL's most successful and dangerous offenses, instrumental in leading Buffalo to four consecutive Super Bowl appearances. Kelly holds the 2nd all-time NFL record for most yards gained per completion in a single game (44), established on September 10, 1995 in the Bills' game against the expansion Carolina Panthers. He recorded an NFL-best 101.2 passer rating in 1990, led the league with 33 touchdown passes in 1991, and made the Pro Bowl five times (1987, 1988, 1990, 1991, and 1992). In his four Super Bowls, Kelly completed 81 of 145 passes for 829 yards and two touchdowns, with seven interceptions. His 81 completions are the fifth most in Super Bowl history behind Tom Brady, Peyton Manning, Kurt Warner, and Joe Montana. In Super Bowl XXVI, he set a record with 58 pass attempts, and in Super Bowl XXVIII he set a record with 31 completions (this was later surpassed). Kelly finished his 11 NFL seasons with 2,874 completions in 4,779 attempts for 35,467 yards and 237 touchdowns, with 175 interceptions, all of which are Buffalo records excluding the interceptions. He also rushed for 1,049 yards and seven touchdowns. Including his time in the NFL and USFL, he finished with over 45,000 passing yards and 320 touchdowns. In 2001, the Buffalo Bills retired his number 12 jersey. On August 3, 2002, Kelly was inducted into the Pro Football Hall of Fame. He was enshrined during the first year he was eligible and headlined a class that also featured John Stallworth, Dan Hampton, Dave Casper, and George Allen. Fellow Hall of Fame member and former head coach Marv Levy was Kelly's presenter at the ceremony. Kelly resides in East Aurora, New York, with his wife Jill and their daughters, Erin and Camryn. Kelly devoted much of his post-football life to his son, Hunter James Kelly, who was diagnosed with globoid-cell leukodystrophy (Krabbe disease) shortly after his birth on February 14, 1997 (which was Kelly's 37th birthday). Hunter died as a result of this disease on August 5, 2005, at the age of 8. This loss deeply affected Kelly. Two of Kelly's nephews, both the sons of his younger brother Kevin, have also played quarterback. Chad Kelly played college football at the Division I level for the Clemson Tigers and the Ole Miss Rebels and took part in the 2017 NFL Draft, in which he was selected last overall in the seventh round by the Denver Broncos, earning the honor of Mr. Irrelevant. Casey Kelly, Chad's younger brother, is still in high school playing quarterback for national power house Mallard Creek High School and is scheduled to graduate in 2019. Kelly's father, Joe Kelly, died on August 21, 2017; his mother died in 1996. To honor his son, Kelly established a non-profit organization in 1997: Hunter's Hope. Kelly's advocacy on behalf of Krabbe patients has increased national awareness of the disease. He and his wife Jill founded the annual Hunter's Day of Hope, which is held on February 14, the birthdays of both Jim and Hunter Kelly. The Hunter James Kelly Research Institute was founded at the University of Buffalo in 2004, where neuroscientists and clinicians are studying myelin and its diseases. When Kelly was inducted into the Pro Football Hall of Fame in 2002, he dedicated his speech to Hunter. "It's been written that the trademark of my career was toughness," he said as he choked back tears. "The toughest person I ever met in my life was my hero, my soldier, my son, Hunter. I love you, buddy." Kelly is a devout Christian, and has several business ventures, including Hall of Fame Life Promotions, a promotional company that is committed to donating a percentage of all of its proceeds to the Hunter's Hope Foundation. In 2011, Kelly founded Jim Kelly Inc. a company which produces the MyFanClip line of all purpose clips which bear sports team logos and other insignia. MyFanClip has licensing agreements with the NFL, MLB, NHL and NASCAR. Proceeds also benefit the Hunter's Hope Foundation. Since 1988, Kelly has run a football camp for youths between the ages of eight to 18 at the Buffalo Bills facilities. It started with 325 campers in its first year, growing to over 500 campers a year. This camp provides teaching from experienced coaches and previous players from all over the country. Kelly also participates in various drills with the participants. On June 3, 2013, Kelly announced that he had been diagnosed with squamous cell carcinoma, a form of cancer, in his upper jaw. He underwent surgery at a Buffalo hospital on June 7. Kelly reported to news outlets shortly after his surgery that the procedure was successful and he was now cancer-free. On March 14, 2014, after a follow-up test at the Erie County Medical Center, it was announced that Kelly's cancer had recurred, and that he would begin radiation and chemotherapy treatment. It was announced on August 20, 2014 that doctors could no longer find evidence of cancer. On November 1, 2014, Kelly announced he had contracted MRSA within his bones, three months after being declared cancer-free. A few weeks after the announcement, Kelly said he was MRSA-free. Kelly announced in March 2018 that the cancer had returned. He underwent surgery that month to remove the cancer and reconstruct his upper jaw. In June 2018, it was announced that Kelly would receive the Jimmy V Award for Perseverance at the 2018 ESPYs. In late June 2018 Kelly returned to a New York City hospital for additional surgery. On January 18, 2019, Jill Kelly announced on Instagram that Jim was cancer free. ^ "Jim Kelly". NFL.com. Retrieved May 20, 2015. ^ "NFL - Players Rosters - National Football League - ESPN". ESPN.com. Retrieved May 20, 2015. ^ a b Neumann, Thomas (October 14, 2010). "Jim Kelly talks football, life, wrestling". ESPN Page 2. Retrieved October 18, 2010. ^ "Jim Kelly, Football, New Jersey Generals". Sports Illustrated (SI Vault). July 21, 1986. Archived from the original on March 10, 2011. Retrieved October 18, 2010. ^ Fmr QB Jim Kelly: Trump 'Took Care of My Whole Family'. Fox News. Retrieved January 27, 2017. ^ "Four Falls of Buffalo - ESPN Films: 30 for 30". espn.go.com. ^ "Jim Kelly". NFL.com. Retrieved March 28, 2018. ^ "Hall of Famers". profootballhof.com. Retrieved May 20, 2015. ^ "The Buffalo Bills will retire a number for only the second time". Fox Sports. Retrieved March 28, 2018. ^ "2002 Hall of Fame Enshrinement Celebration Coverage". Pro Football Hall of Fame. Retrieved March 28, 2018. ^ a b Wawrow, John. "Former Bills QB Kelly battling cancer of the jaw". Yahoo Sports. Archived from the original on June 8, 2013. Retrieved June 4, 2013. ^ "Nkemdiche has surprise TD in 76-3 win for No. 17 Ole Miss". ^ Fornelli, Tom (October 7, 2016). "WATCH: Ole Miss' Chad Kelly storms field during brawl at brother's high school game". CBS Sports. Retrieved October 16, 2016. ^ "Led by another Kelly, St. Joe's triumps". The Buffalo News. September 2, 2016. Retrieved August 21, 2017. ^ "Instagram post by Jim Kelly • Aug 22, 2017 at 3:10am UTC". Instagram. ^ "Jim Kelly: I'm now 'cancer-free'". ESPN.com. Retrieved July 19, 2013. ^ "Hall of Fame QB Jim Kelly's cancer returns". cbc.ca. March 14, 2014. Retrieved May 20, 2015. ^ "Doctor: No evidence of cancer for Jim Kelly". ^ "Report: Jim Kelly says he has MRSA infection". USA Today. November 1, 2014. Retrieved November 1, 2014. ^ Mike Rodak (March 1, 2018). "Jim Kelly to begin treatments after oral cancer returns". espn.com. Retrieved March 1, 2018. ^ a b "Kelly to get Jimmy V Award for cancer fight". ESPN.com. Retrieved June 4, 2018. ^ Lott, Thomas (January 18, 2019). "Hall of Fame QB Jim Kelly reveals he is cancer free once again". Sporting News. Retrieved January 21, 2019.